The core of the Magic Leap project, a headset, computing pack and handset. The new package will also contain software to develop apps. Magic Leap, the augmented reality company that's been promising a computer-augmented reality kit that will change the way we view the universe, has officially launched a developer kit. The new kit, named the Magic Leap One Creator Edition, is available now. 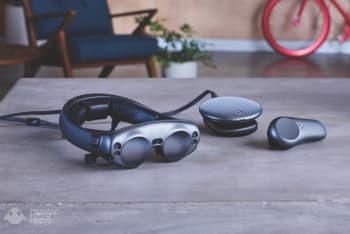 According to Magic Leap, the Creator Edition comes complete with a Lightwear headset, Lightpack computing pack, Control handheld input device, a headset Fit Kit, chargers, and a Quick Start Guide. The total package will run you $2,295. In addition to those hardware components, the Creator Edition also gives keen AR developers a few key software tools to develop their own projects, and also to inspire them to think about the "mind-expanding" capabilities of the new platform. First among the software components packed into the Creative Edition is LuminOS, the company's operating system. While I'm not sure exactly what the company means, they've touted the OS as a base application that works "in tandem with the brain" through a set of SDK tools, machine learning something-or-other, and middleware. Apps for Magic Leap can be developed using the Magic Kit, a set of tools, tutorials and sample code that will, presumably, make developing Magic Leap applications as easy as possible. Aside from the development end of the package, the Creator Edition also comes with a few "preview experiences" including a "Tónandi, a collaboration between Sigur Rós and Magic Leap Studios" and Create, a sandbox mixed reality experience where you can do things like "[t]urn your house into an undersea world." Obviously, Magic Leap's Creator Edition isn't for casual AR consumers. The Creator Edition is meant for those itching to get their hands on a new development platform where they can hand-code apps to expand the Magic Leap app library and make the platform ready for consumers. If you're in either New York, Chicago, Los Angeles, San Francisco or Miami, you can get your hand on a Creator Edition package right away. Otherwise, you can make a reservation to have the kit delivered to you sometime in the future.